has anybody checked ice on swinging bridge or toronto reservior? I was there and we thought there was a tournament at the north end, never saw so many guys up there. Earlier quote. Yup, mention something on here just a little positive and the area gets bombarded. Not just a particular body of water, but in this case, an area of the lake. Yoi. Can gas augers be used on Superior? It was bombarded because it's one of the few places with safe ice. I didn't see any posts prior to the weekend about safe ice at Superior. It's a well known popular place. It's bound to happen but you know people push it. I always figure if the spot meant that much some one got there earlier good on them. More than once the guy who moves on finds a jem somewhere else. Hope everyone is catching. My son and I Hammered the dinks tonight. Looks like storm path is not locked in as of yet. Westchester/Putnam may get wintry mix or 12-15 Plus. One of those "who knows" storms. At least all waters are locking up after these past few days...…. Many of the bait shops here in dutchess don’t have bait yet, and don’t expect it by the weekend. Where are you getting it locally? Hello fellow Southern NY. ice anglers good to read many of you got out fishing this past weekend. I believe the Reports & Conditions forum/board is only viewable by registered members of this website maybe if all of us posts our questions about ice conditions and stories of fishing trips on that forum we will not see crowds at certain lakes. The NY. General forum is viewable by anyone who visits this website. I know currently there are not topic/threads for all areas of southern NY. in the reports-conditions forum possibly if more of us post there we can convince the NY. moderators to create more topics/threads. It would be nice to see a topic/thread for each county in NY. I do not fish with tipups to much any more but would like around 100 feet between me and other fishermen if I have them set out depending on when I arrive at a lake and the amount of activity I try to spread my tipups over a large area and then move them closer together if one tipup get multiple hits. If during the day the lake gets more crowded I will move my tipups into a smaller area. I'm out to relax and enjoy the day so try and be polite and friendly to others out on the lake. Kb depending on your location in Dutchess county this may be a long trip but Gander Outdoors in Kingston maybe a source for bait. The store is locate in a shopping mall off of route 9w. Tightlines only have basic information on the lakes you mentioned. fourth Binnewater was at one time being stocked with northern pike and had special fishing regulations for the pike. I believe the stockings stopped ten or more years ago so pike population maybe small or nonexistent . Looks like you park along the road section of lake by road has max. depth of ten feet there is a section on main body of lake with depth of eighty feet. Onteora lake was being stocked with tiger musky at one time and might still be so steel leader or heavy fluorocarbon maybe a good idea on your tipups and heavier action rod and tackle for jigging . You have to walk a short distance from the parking area to reach the lake. The lake has a dark colored bottom where you would access it from the parking area and appears to drop off quickly from the shore line. Kiamesha Lake can be accessed from route 42 side of the lake has the fish usually found in most southern Ny. lakes chain pickerel, yellow perch, crappie, blue gill, large mouth bass. Hope this is of some help. May the coming storm not affect our lakes to badly. "Kiamesha Lake can be accessed from route 42 side of the lake has the fish usually found in most southern Ny. lakes chain pickerel, yellow perch, crappie, blue gill, large mouth bass. Hope this is of some help." I was on Google street view (from August 2018) and wherever there is a pullover there is an orange "WARNING" sign. I can't make out what the sign says but it looks like a posted sign. Do you know what the signs says? Bowski76 I've seen the signs and they say posted property ,but have also seen vehicles parked in the pull offs and folks fishing that side of the lake. So to you and Tightlines I suggest calling Monticello police and see what they tell you about parking their and fishing. Sorry for any confusion my previous post may create I've never ice fished at Kiamesha Lake only observed others in my travels or seen footprint in the snow on lake's ice surface. Onteora Lake hasn't been stocked with tiger muskies since 2003. Don't know much about Kiamesha lake...DEC lists it on there sit maybe inquire there first. Kiamesha IMO is in a state of Limbo at present. It was always a part of the Concord Hotel property and private property. However, when the Concord property was purchased and planned to become a part of the new casino property those plans went south pretty quick. One fellow purchased that portion of the property and the existing Monticello Raceway owners purchased the other half where the new casino now stands which also encompasses the old Monster golf course. The partnership fell apart shortly after the old hotel was torn down and the footings for a new building began being installed. That fellows name is Capelli. I suspect he still owns the property but missed the boat with the financing to continue building and the company that owns the new casino wants nothing to do with him. I do see guys fishing on the ice and from shore and in small boats and have never seen the authorities hassling any one. That does not make it OK to fish there but plenty of guys do. You are on your own if you decide to try it. I would love to know the details about the lake, how deep it is and what fish tend to be caught. If I agreed with you we would both be wrong! Hey Gam, you are right Cappelli Enterprises (Louis R Cappelli, billionaire) owns (or owned) the lake and is the second largest shareholder at the new casino. He did a lot of building in Westchester with his partner Donald J Trump. Good evening ,Hardwater Diehard ,Gamalot,Jignut my thanks to all of you for posting additional information on Kiamesha lake. Tipup28 thank you sir for the info. on Onteora lake . Here is the phone number for ranger station 845-457-4918 . the park closes at sun down. Closest places to get bait are Tom's Bait shop in Fair Oaks and Thruway Sporting Goods in Walden (same shopping area as Hanaford super market) I believe Thruway's hours are Mon.-Thurs. 8AM-8Pm, Fri.-Sat. 8AM-9PM, Sun. 8AM-6PM. the fishing section of store is located at top of ramp on second floor the ramp is on left side of main floor. Phone 845-778-1400.
kbaez, I like the sled mod! I would make a fitted cover to keep all your gear dry from the snow and elements. Years ago I made a hinged bench seat along the length of the jet sled. Two purposes, I used it as a table for my stove/coffee pot or I would use it as my jigging seat. two less things I had to drag along(seat, portable table). I fished last Saturday for a few hours on a popular Sullivan lake with about 10 other peeps.. Drilled about 20 holes and moved around but couldn't shake the dink perch. Gave up. Tip up guys seemed busy. Checked some long island ponds that had 2-3 inches of black ice today, definitely little sketchy but caught some fish and good to get out close to home. Got checked by DEC today too, nice guy and good to see them out. NY. 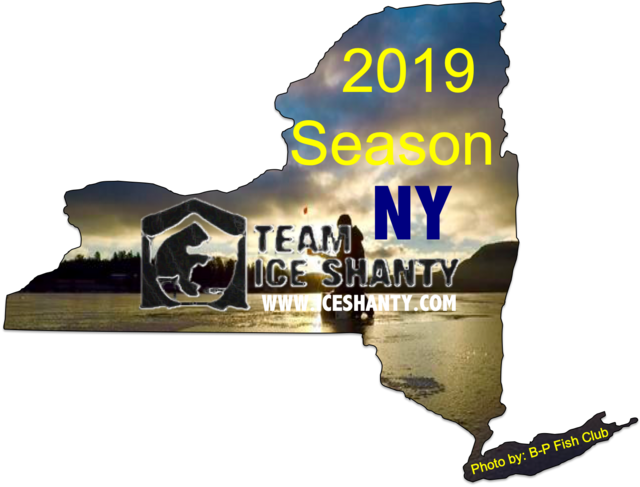 Basser hopefully the coming storms do not set all of us back with our ice fishing may temperatures stay cold enough so the lakes on Long Island make more ice and you can fish locally this Winter. Kb thought I saw a post about Upton the other day now I can not find it. I'll PM you if further searching turns up the post. Any Luck finding bait fish. Tipup28 thank you for the report on Chodikee Lake. Did you get to Louisa to check the ice formation. Staying optimistic the coming storms will not cause us major problems and temperatures stay cold enough to make more ice . Here are some more phone numbers you may find useful. I'm sure some of you already are aware of this but the commission has a policy where they want a minimum of 6 inches of ice on a lake before they will allow ice fishing. Only certain lakes in Sterling and Harriman will be open for ice fishing if conditions are good. I strongly suggest making a phone call before heading to any of these parks. In past years lakes on which ice fishing is allowed were not checked on a daily basis. So evenif we have over a week of below freezing temperatures for the daily highs some lakes may still be closed. Personally seen a few years when only one small pond in Sterling forest was open upon inquiring why told rangers staff is shared between both parks and has limited time to heck ice conditions. Hopefully they have added more rangers and things have improved. Looks like 8-12 for the Orange County area and 12-18 for Sullivan County area Catskills and ADKs anywhere from 18"-3FT! Hope they are wrong! Checked upton yesterday. Air temp was 40 degrees... still 4” of ice. I’m headed back there this morning to see if I can get some trout on my hooks! Justinrc21 ,welcome to Ice Shanty. Thank you for the report on ice conditions at Upton Lake in Dutchess county. May you bring some trout onto the ice if get out to Upton today. 4" of clear black ice at White Pond. do you mean , that one in carmel ? did you see anybody outhere?